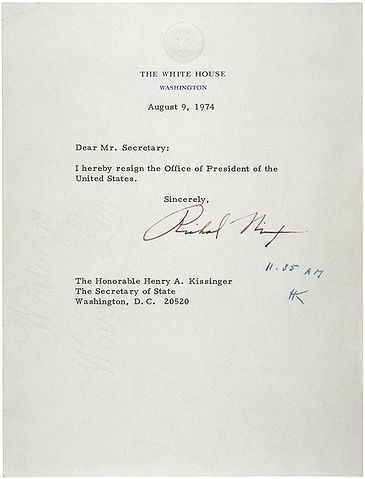 Forty years ago, on the evening of Thursday, 8 August 1974, the 37th President of the United States addressed the nation in a television broadcast and announced that he was resigning with effect from noon the following day. On 9 August, Vice President Gerald Ford—who had himself only taken office in October 1973 when the previous incumbent had resigned when charged with bribery, conspiracy and tax fraud—succeeded to the most powerful job in the world. 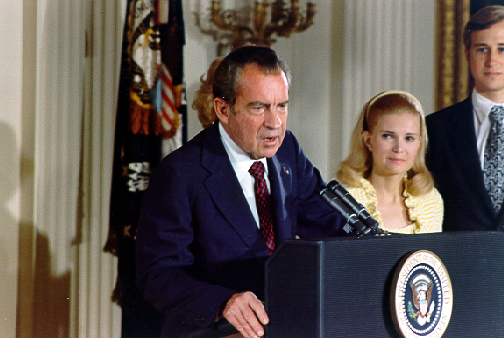 The Supreme Court ruled at the end of July 1974 that executive privilege was not unlimited, and that Nixon must surrender incriminating tape recordings—recordings he himself had ordered, obsessed with memorialising every detail of his presidency; he employed an army of ‘anecdotists’ as well as taking his own notes. The contents of the tapes finally destroyed Nixon’s credibility and led most of his Congressional supporters to vote in favour of impeachment. Even Henry Kissinger, his Secretary of State, National Security Adviser and close friend, had told him on 6 August that he should go: an impeachment trial would paralyse foreign policy and demean the Presidency. Faced with all this, Nixon decided to resign. By this time, successive revelations meant the decision was not unexpected and caused surprisingly few ripples across the world: most British political diaries and memoirs fail to mention it at all, while in the Soviet Union, where Nixon had visited only 6 weeks before, President Brezhnev fretted only that Nixon’s disgrace might weaken his own reputation. But the resignation of a US President, leader of one of the world’s two Cold War superpowers, was a unique event nevertheless. ‘I have never been a quitter’, Nixon said in his broadcast, but ‘as President I must put the interest of America first’. Though apologetic up to a point, expressing regret for ‘any injuries that may have been done in the course of the events that led to this decision’, he was not reticent about his achievements. Since becoming President in 1969 he had, he claimed, ended ‘America’s longest war’ in Vietnam by the agreement signed with North Vietnam in January 1973; ‘unlocked the doors’ between the USA and Communist China by his groundbreaking visit in February 1972; achieved a limited degree of peace in the Middle East, still in turmoil after the Yom Kippur war of October 1973 (including, crucially, Saudi agreement to resume oil sales to the US); and signed an important arms limitation agreement (SALT 1) with the Soviet Union in 1972. Though some of these achievements were incomplete or hedged with qualifications, they were nevertheless considerable. As Christopher Andrew puts it, ‘The Nixon-Kissinger combination was arguably the most talented ever to run American foreign and security policy.’ And though the idea has become a commonplace that preoccupation with Watergate took Nixon’s eye off the ball in both domestic and foreign policy during the 18 months before his resignation, the evidence does not entirely support this. It is easy to say what Nixon ‘would have done’ in a particular situation if not distracted: but impossible to prove. Who is to say inaction or delay was not a deliberate policy choice? For example, when Nixon and Kissinger resisted pressure from British Foreign Secretary James Callaghan to take a tough line in the Cyprus crisis in July 1974, the evidence suggests their reluctance was rooted in a calculation of US interest, rather than a lack of interest. The context of Nixon’s resignation was a high degree of global political and economic instability in which the energy crisis caused by the Middle East war of 1973 and an Arab oil embargo against the western powers was a major factor. 1974 saw a number of game-changing events, including the Turkish invasion of Cyprus and the downfall of the Colonels’ regime in Greece; the fall of the Caetano regime in Portugal and the end of Portuguese colonial rule in Mozambique; the failure of Kissinger’s ‘Year of Europe’ and a fractious relationship between the US and Europe in which the British government, in its first year of EEC membership, found itself in the familiar position of piggy in the middle. Significant figures other than Nixon left the world stage in 1974. Some exits were permanent: in France, the death of Georges Pompidou in April brought the Gaullist era to an end, and the Presidency to Giscard d’Estaing; in Argentina, the veteran President Juan Peron was succeeded by his second wife, Isabel; in West Germany, the resignation of Willy Brandt over a spy scandal made Helmut Schmidt the new Chancellor; and in Ethiopia, riots and student protests so undermined Emperor Haile Selassie that he was deposed in September. Other departures were temporary: President Makarios of Cyprus, ousted in a Greek coup in July, was to return to office in December; in Spain, the ailing dictator General Franco handed over power to Prince Juan Carlos - but only for a few months; and in Libya, the erratic Colonel Qadafi was relieved of day-to-day duties by the Revolution Command Council in order to concentrate on the ‘ideological direction’ of the Libyan people - but remained head of state. Against this context, Nixon’s resignation may seem just one more shifting pattern in the kaleidoscope. But 40 years later, the contrast still seems shocking between the President’s experience, abilities and undoubted flair for international affairs, and the depth of his disgrace. Nixon was wracked by insecurity and believed that the only way to succeed in politics was to get your retaliation in first: at some point, he lost the ability to distinguish between threat and reality, executive power and contempt for the law. Documents on British Policy Overseas, Series III: Vol. IV, The Year of Europe: America, Europe and the Energy Crisis 1972-74; Vol V, The Southern Flank in Crisis, 1973-76 (London: Routledge, both 2006).